The Sacrum Course has a lecture on the functional anatomy, diagnostic landmarks, tests and findings for the different somatic dysfunctions of the sacrum. Then, the primary focus of the course is on the lab demonstration of how to diagnose and treat the different somatic dysfunctions of the sacrum. The core manual medicine treatment modalities covered in this course are Muscle Energy, Lateral Syms Articulatory Technique, and Soft Tissue Techniques. Understand the functional anatomy of the sacrum. 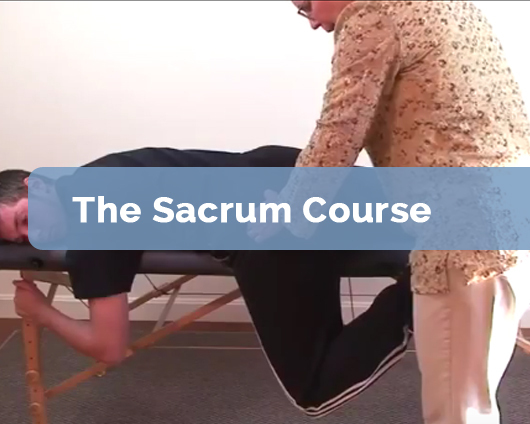 Review how to diagnose and treat the sacrum properly for somatic dysfunction. Understand how to apply Muscle Energy, the Lateral Sym’s Articulatory Technique, and Soft Tissue Techniques to the tissues of the sacrum. The Sacrum Course: 2.5 Hours. This includes watching the video course, practicing the technique, filling out an evaluation and taking the test. The AOA Council on Continuing Medical Education approved this online CME activity for a maximum of 2.5 hours of AOA Category 1-B CME credits. UNECOM designates this online CME activity for a maximum of 2.5 AMA PRA Category 1 Credit(s)TM.